A new St. Petersburg home owner and her daughter - commercial Florida photography - Nikon D300 Tamron 17-50mm @ f/8 ISO 200 1/125th - Strobist: SB-800 @ 1/1 power in 43" brolly to frame left & SB-600 @ 1/1 power in 43" shoot through umbrella to frame rightThis was my second time (see first shoot) making a promotional photograph of a new homeowner for Crown Group Realty. I really like these kinds of shoots going out on location and only needing to produce one or two images. Rhonda and her baby daughter were great and the shooting part took less time than it did for me to setup my speedlights! 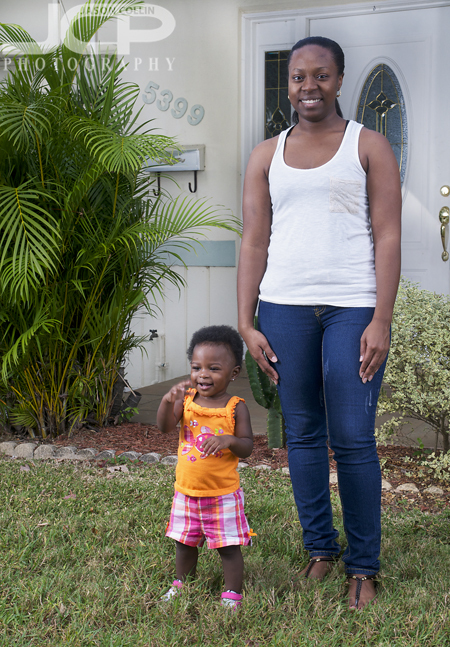 Mom & daughter in front of their new home - commercial Florida photography - Nikon D300 Tamron 17-50mm @ f/8 ISO 200 1/125th - Strobist: SB-800 @ 1/1 power in 43" brolly to frame left & SB-600 @ 1/1 power in 43" shoot through umbrella to frame rightI intended to make the above shot only, but after seeing how active her daughter wanted to be I took some shots like the first one with her walking on her own. I ended up delivering both to the client as a bonus. I hope they enjoy their new home!